-Sift flour in a bowl,add in the salt,baking powder,baking soda without lumps. -Dissolve the jaggery in 1/5 cup hot water and strain to remove impurities.Keep aside. -Add in the dry fruits & nuts chopped as listed so that the fruits and nuts are well coated.Mix with a spoon or hands. -Preheat oven to 325 degrees F,Line a square baking pan 8 * 8(I used glassware) with aluminium foil at the bottom and sides. -Whisk the egg till fluffy in another bowl and add in the vanilla extract.Add in the dissolved jaggery. 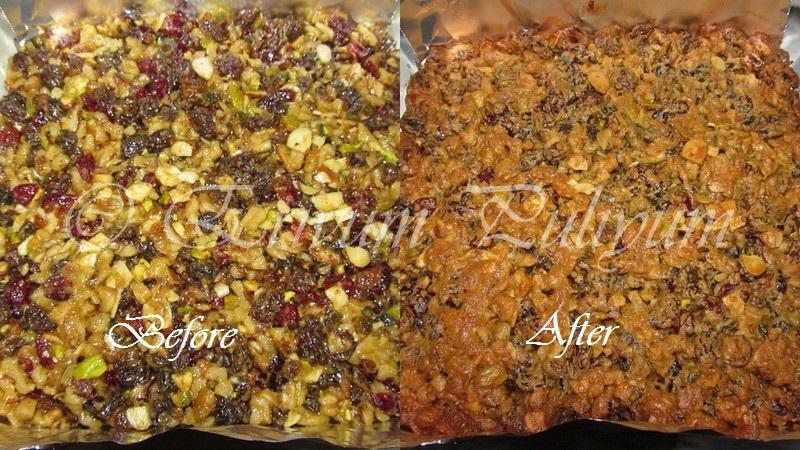 -Mix the egg mixture in the dry fruits & nuts mix and coat well to get a sticky batter. -Spread the mix evenly in the prepared pan,pressing it down till the corners and with the help of a spatula or back of a spoon. -Remove from pan and cool on wire rack .When cooled lift the edges of the aluminium foil and get it out of the pan.Cut into pieces and serve. * The bars can stay good for 10 days at room temperature or longer after refrigeration. * You can add in any desired dry fruits of your choice,keeping in mind the quantity remains the same. * I used egg in this recipe as I was short of bananas,but I have easily tried out the Banana oats bar in which had used banana as the binder. * You can use light brown sugar instead of jaggery. 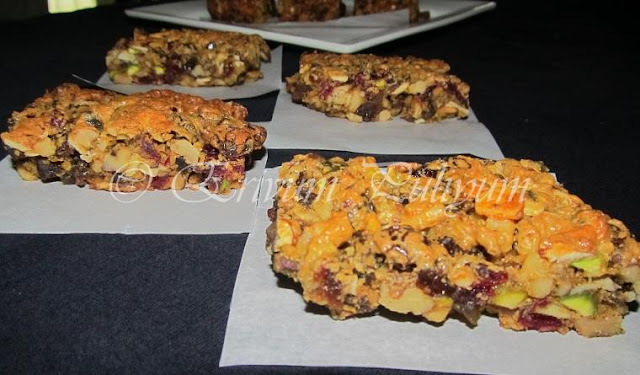 Wow extremely chewy and super nutty bars..
fantastic bars......i think if i made these at home..they wouldn't be just kept for breakfast..my kids would happily be sitting with these bars through the day...tasty! I never skip my breakfast and I cook something almost everyday. 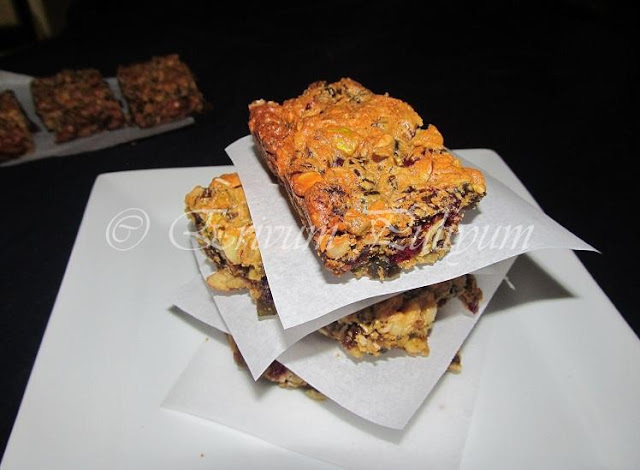 When I can't make I eat these bars( as you have made)or healthy cookies with with fruit and seed smoothie. Good one!!! That's a healthy bar, you have used jaggery in the place of sugar, you have been tagged by me, visit my space.. I love it when the bars are chewy. And so fruity! looks so delicious. Thanks for the egg sub. the bars have come out so well julie.. this is on my list of must try items.. They looks so good,healthy and yummy bars..
Julie the bars look really delicious and colorful. Wow those bars are so delightful!! you made them perfectly !! wow julie...the bars hav come out so well!!! !bookmarking it...will definitely giv it a try !!!! Bookmarked Julie.... a shouldv try healthy bar......awesome.. This chewy and nutty bars are really a keeper. Nicely done !! Great idea for breakfast skippers (like ME)! These look absolutely delicious! 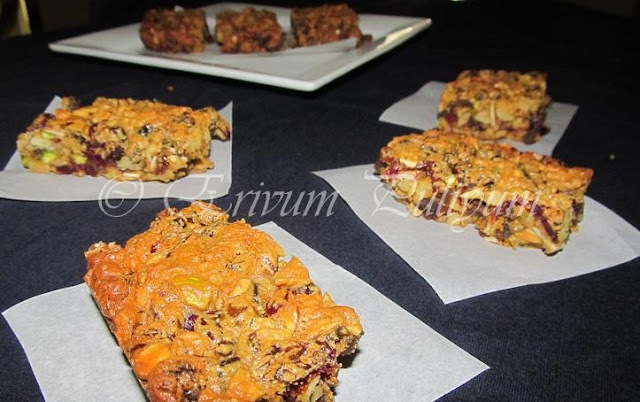 I can't believe I've never made a fruit and nut bar before! Yum! Very crunchy, healthy and yummy bar. Very delicious also.Thanks for linking my event. Rich & healthy bars, that looks and sounds so good! Breakfast is definitely the most important meal of the day and I too don't like skipping it. Healthy scrumptious great! There are so many adjectives that can be used for these incredible chewy bars. Great post! great for breakfast or snack..delish. Delicious bars...perfect for a quick breakfast! Woww... delicious and tempting bars recipe.. looks absolutely inviting.. thanks for sharing ! !